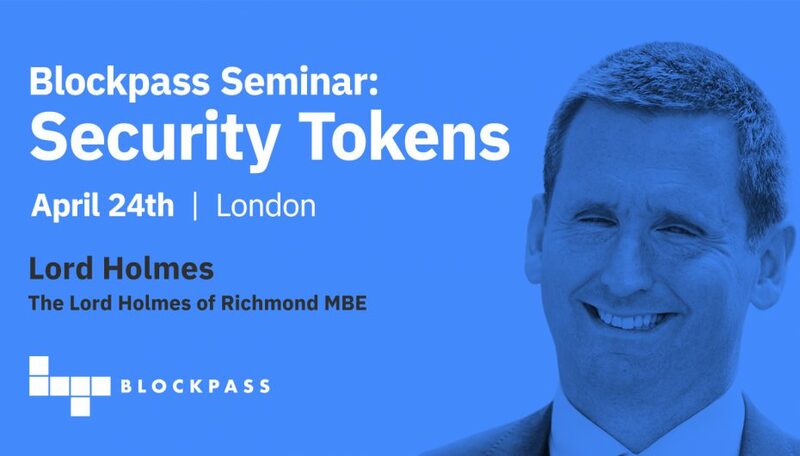 Blockpass announced today that Lord Holmes of Richmond MBE will be the Keynote Speaker at its upcoming Blockpass Seminar: Security Tokens. As a passionate advocate of emerging technologies, Lord Holmes brings an enthusiasm for distributed ledger technology and blockchain applications to the already packed programme of speakers. As well as being Britain’s most successful Paralympic swimmer, Chris Holmes is a passionate advocate for the potential of blockchain and other frontier technologies driving the Fourth Industrial Revolution. In 2012, he was Director of Paralympic Integration, responsible for the organisation of the Paralympic Games in London. He is a passionate advocate for the potential of technology and the benefits of diversity and inclusion and was invited to head a government review that will make recommendations on how to encourage more disabled people to apply for public appointments. In Parliament, he has been a member of Select Committees on Artificial Intelligence, Digital Skills, Social Mobility and Financial Exclusion. He is also co-chair of the All-Party Parliamentary Groups on Assistive Technology, Fintech, blockchain and the 4th Industrial Revolution. Blockpass is a leading RegTech and Compliance business which provides digital identity verification as a service. Through its vast network of partners, Blockpass is creating an ecosystem of pre-verified customers for easy and seamless customer onboarding for any regulated business and industry.